Randomized experiments are invaluable in making product decisions, including on mobile apps. But what if users don’t immediately uptake the new experimental version? What if their uptake rate is not uniform? We’d like to be able to make decisions without having to wait for the long tail of users to experience the treatment to which they have been assigned. This blog post provides details for how we can make inferences without waiting for complete uptake. At Google, experimentation is an invaluable tool for making decisions and inference about new products and features. An experimenter, once their candidate product change is ready for testing, often needs only to write a few lines of configuration code to begin an experiment. Ready-made systems then perform standardized analyses on their work, giving a common and repeatable method of decision making. This process operates well under ideal conditions; in those applications where this process makes optimistic or unrealistic assumptions, data scientists must creep from the shadows and provide new approaches. In the Google Play app store, challenges such as these regularly occur, as the basic framework of mobile technology introduces many wrinkles in experimentation and measurement. The Play Data Science team works to develop appropriate approaches to these cases and develops reusable methodologies to broaden the capabilities of Google Play experimenters at large. When we set a treatment and a control group, we typically assume that, instantaneously, each unit within the treatment experiences the treatment condition, and each unit within the control instead gets some manner of baseline condition. This assumption of total compliance allows us to make strong inferences about the impact of the treatment condition. However, there are common cases where this assumption could be broken, most notably in mobile. Naturally, this issue is of particular concern to us in the Play Data Science team. Suppose a developer of a game wants to release a new major version of the game. They have a lot of users already playing their game, and the developer is eager to see what effect the update will have on them. They have a clever thought to run an experiment, offer some users the new version with a popup notification within the game, and don’t tell the rest about it. Then, by comparing the two groups, they can see exactly what benefits (and problems!) they get with the new version. Once they proceed with this, immediately they run into problems. First, as soon as they offer the version, not everybody agrees to upgrade. Some users immediately rush to upgrade, others are slower because they rarely play the game, or have some technical trouble installing the update until days or weeks after the offer is sent. Some users even refuse to update, being happy with the current version and adverse to change. Even worse, some users in the control group manage to get ahold of the new version. Clearly, drawing conclusions from this messy experiment will require more sophisticated analysis. Abstracting this problem a bit, the total compliance assumption breaks down here — some units assigned the treatment do not receive it immediately. Instead, a non-random subset of units receives the treatment, where the membership of a unit within this set is a function of covariates and time. In our example, users who rarely interact with the game will likely adopt the treatment more slowly, causing them to be underrepresented in the set of treated users in comparison to the population of users. Further, units in the control group may manage to receive the treatment, despite the assignment setup. In our example, this corresponds to sideloading, when a user obtains the new version of the game despite it not being offered. Given this situation, a natural response is this: why not just wait until all the users in the treatment have upgraded? Even if we ignore the sideloaders (users in the control who take the treatment), we can’t always take this path. Though sometimes we can wait until most users have completed the update to draw conclusions, we usually want to make inference quickly. For example, we might want to stop the process if we measure harmful effects early. We also might want to use early data to make a decision whether or not to release the treatment to more users, giving us more measurement power later on. In these cases, we must address the bias on the early data, when only a fraction of users who can eventually update their game have done so, and those that have are a non-random subset of the population. For example, perhaps users who have been historically more engaged with the game will update first. To summarize the rest of this post, we first characterize the main issues with these sorts of experiments. 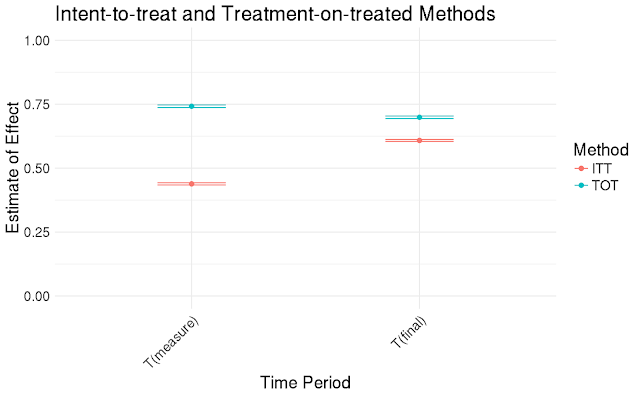 We then build our methods from a simple baseline method: intent-to-treat analysis. Finally, we expand our methods to include notions of which users are treated, and using the control to match users with similar upgrade probabilities. The analysis here focuses on an experiment where a set of users is randomly assigned to one of two experiment arms:treatment or control. We observe for each user a set of units with covariates or user features XiXi and an associated response of interest YiYi. In our introductory example, this response might be the number of times a user opens the game each day. User features might be the country, device quality, and a bucketed measure of how often the user has played the game in a predefined period prior to the experiment. We are interested then in measuring the effect of the treatment on our response YiYi. We make the simplifying assumption that the impact of the treatment is instantaneous and does not further evolve over time. From here, the situation is complicated in a few ways, which we now explore in detail. Fig 1: Only a fraction of users in the treatment group adhere to the treatment. Some take a significant time to adhere. A natural question that follows from the graph of user treatment adoption: what users are actually receiving the treatment here? Typical factors that could influence update speed might be system properties like connectivity (better means faster upgrade), hardware quality (higher means faster), or core operating system software. More user-based covariates could be factors like country or current frequency of use of the product. From the point of view of making valid statistical inference, we can assess if the mix of units who have actually received the treatment reflect the overall population. Loosely put, the degree to which the treated units represent a simple random sample of the population has implications for our ability to draw generalizable conclusions from our experiment. One way to assess this is compare the set of treated units within the treatment group (Q=1Q=1; U=1U=1) to all units assigned to the treatment (Q=1Q=1). Since units satisfying Q=1Q=1 are a random subset of the overall population, this comparison will give us hints as to how effectively we can generalize our conclusions. Fig 2: Treatment units experiencing treatment are rather different from the population as a whole. This is shown here for one particular dimension, usage. It is clear from this plot that the two distributions do not match. Further, we see some expected discrepancies: users who have been more highly engaged in the game are more likely to actually experience the treatment. Perhaps they are more enthusiastic to upgrade, or perhaps this covariate is correlated with other more impactful covariates such as the quality of the user’s hardware. In any case, it is clear that we cannot make inference without some caution in this case. Following our running example, after the game developer begins their experimental release they want draw conclusions about its impact as soon as possible. As mentioned previously, we could wait to do the analysis until all the users who may eventually upgrade actually, but this is typically impractical. However the strategy of waiting until all (who will comply) have received the treatment is useful as a ground truth for evaluating our methods in the following. For each method, we can compare the conclusions we can draw at the beginning of the process to those we would get at the end. We can then choose the methods where these two conclusions match, or at least where the first is a more useful nuanced view. We build our models at two time points: t=Tmeasuret=Tmeasure, and t=Tfinalt=Tfinal. TmeasureTmeasure represents a time point at an early stage, where we would do our experiment analysis in a ‘real’ situation. We assume that the effect of the treatment does not evolve over time. This allows us to compare the two results directly. This is often an unrealistic assumption in applications. For example, users of a game will probably behave differently across days of the week, and their behavior will evolve as they learn the game through experience. We leave it aside in this post so we can clearly explain and explore the remaining issues. 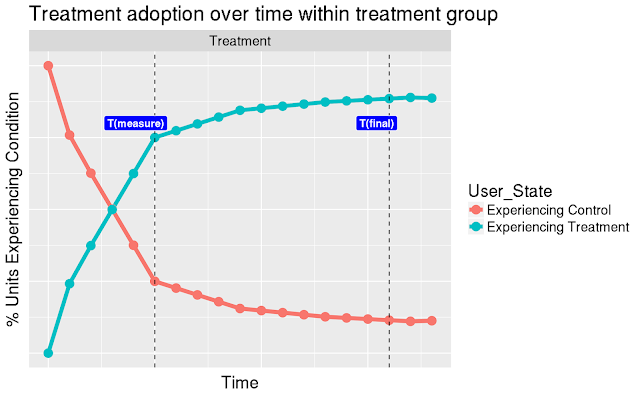 Fig 3: The above figure illustrates a typical case: we can afford to wait a short amount of time for a reasonable percentage of users to adopt before doing analysis (TmeasureTmeasure). In order to get more comprehensive adoption (TfinalTfinal), we would have to wait a significantly longer time. In the language of counterfactuals, this gives the difference between the outcomes under the two different treatment conditions. In a simple experiment, we assume that the random assignment to experiment arms is enough to give us a reasonable estimate of this quantity from standard methods, which rely on each group being a simple random sample from the population over which we wish to make inference. where YiYi refers to the measured outcome for a single unit, NQ=1NQ=1 and NQ=0NQ=0 are the number of units measured in the treatment and control group, respectively. [⋅][⋅] evaluates to 00 or 11 depending on whether the boolean expression within evaluates to false or true (Iversonian notation). Fig 4: How the ITT and TOT estimates evolve over time. Here, we see that the ITT method performs poorly; it estimates quite a different effect at the beginning (t=Tmeasuret=Tmeasure) than at the end (t=Tfinalt=Tfinal) of the period. This is likely because the number of users experiencing the treatment is increasing over time, and so the earlier estimate is shrunk more strongly towards zero. The TOT method performs somewhat better in terms of stability, but the estimate declines between the two time points. The differences between the distribution of users experiencing the treatment and the population are likely to be a key factor here. Indeed, both of these estimators do not well estimate the treatment effect for all users if this set of treated users is not a random subset of the population, and if the covariates that differ between this subset and the population are also correlated with our outcome and the treatment effect. From our earlier analysis, we can see that this is not the case by comparing the distribution over one categorical covariate. To proceed, we fully characterize the types of units that are more likely to adopt the treatment at an earlier stage in our experiment. 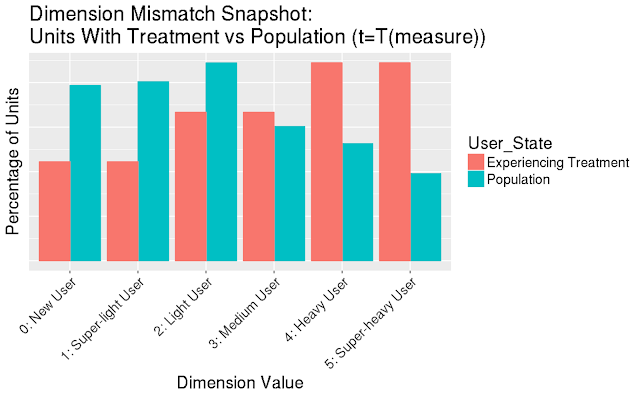 A central issue in this application is that users assigned treatment sometimes do not actually experience the treatment at TmeasureTmeasure, and furthermore this set of users is not random. Here, we can draw a direct analogy to Compliance Bias, which is primarily described in literature on the analysis of medical studies. This type of bias can occur when users do not adhere to their assignment to an intervention plan, for example when patients with less acute disease symptoms more often refuse to take a drug they were given. In the context of this application, these rows have already so far been roughly explored. Users in the control are expected to behave as (0,0)(0,0) indicates (not offered the upgrade, don’t take the upgrade), and users in the treatment group may be in state (1,0)(1,0) or (1,1)(1,1). Users realized in the case (0,1)(0,1) may seem impossible or surprising, as they represent a sort of leakage of the treatment condition into the control group. These correspond to sideloading behavior, where a user obtains the update without an offer, possibly through internet backchannels, which was discussed above. While they may exist in theory, do we have units of each of these types? In our application, never-takers (units who can never execute an update) and compliers (units who will upgrade if given the chance) seem reasonably common. Note here that we evaluate UU at TmeasureTmeasure, so never-takers here are those who would not experience the treatment at TmeasureTmeasure, regardless of assignment QQ. We will ignore always-takers and defiers, since in our application the number of users with realized (0,1)(0,1) outcomes are extremely rare (≪1%≪1%). This implies our population consists overwhelmingly of compliers and never-takers. This greatly simplifies our situation, and makes full conditional observable or conditional compliance modeling approaches unnecessary . Conditional compliance models estimate causal effects for each of the four types of users in the table. Conditional observable models try to estimate relationships between all four counterfactual quantities for each user. Fig 5: Estimated probability of experiencing the treatment in the treatment group. Observe the subset unlikely to uptake. We see that a collection of never-takers immediately stands out with very low estimated scores, a clear conclusion even from the start of the study. These users can be safely discarded from our effect estimation analysis. Further, the existence of never-taker users calls into the question of the ITT analysis, even at TfinalTfinal. If there are users who will never experience the counterfactual treatment state, then ITT will never estimate the difference between these states if those users are included in the estimation. Otherwise, the model produces a decent range of Pr(U=1|X)Pr(U=1|X) predictions, and we can see from the plot that the number of users with U=1U=1 are more common at higher probabilities. As a classifier, the model gives merely decent performance, which is actually advantageous for propensity methods. If in this case we instead had a clean separation of the two classes for all users, this would imply that certain user factors completely determine adoption. 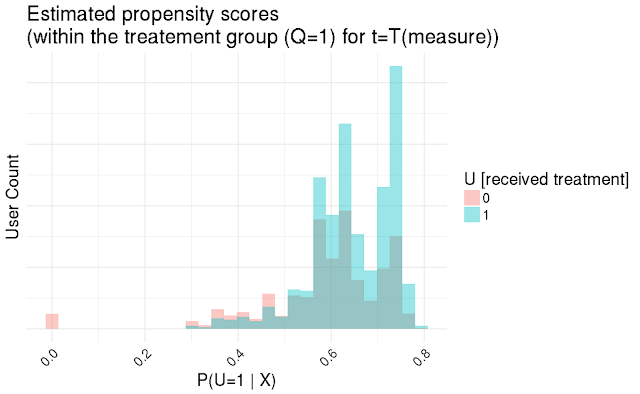 Therefore, within the treatment group, many users with U=0U=0 would be without a peer user with U=1U=1, so we could not reasonably estimate our target effect. We then would not be able to generalize our conclusions to the entire user population. This problem would be somewhat mitigated if only a subset of users have estimated probability 00 or 11, and we were therefore able to understand clearly for which users we cannot estimate the effect / cannot find matching users. It is useful to examine the results per strata, as the following plot does. Here, we compare the results on users at both TmeasureTmeasure and TfinalTfinal, where the strata and p^p^ are defined by the model fit at TmeasureTmeasure only. 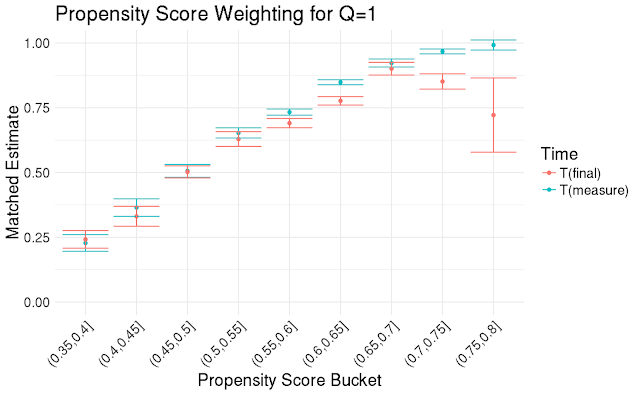 Fig 6: Propensity scores estimated for each stratum. For the most part, the estimates are in good agreement, but differ significantly in the high propensity strata. We first see that the model performs well for the lower strata (e.g. (0.45,0.5](0.45,0.5]), in that the estimate at TfinalTfinal is close to that made at TmeasureTmeasure. The approach performs worse for higher buckets, which is expected as there are fewer users with Q=1,U=0Q=1,U=0 here. A more striking overall point is that the effect is not uniform across the buckets. In fact, the impact of the update increases as our estimate of Pr(U=1|X)Pr(U=1|X) increases. This means that for different users, the new game has a different effect. This is a valuable insight that the ITT and TOT approaches do not provide, as their estimand assumes that the treatment effect is a universal mean shift across all users. 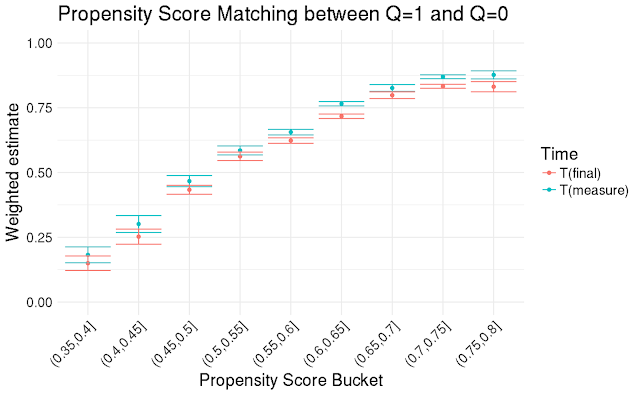 The results here are similar to the previous approach in the lower propensity score buckets. The main improvement comes at the higher buckets, where the estimates at TfinalTfinal and TmeasureTmeasure are now as close as in the other buckets. 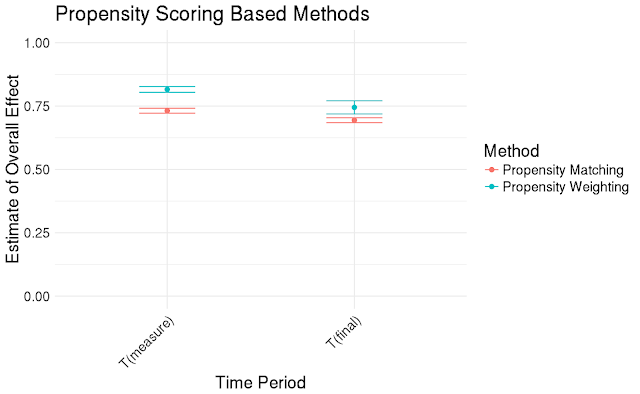 The core reason for this improvement is that in this approach, we have many users available in the control (Q=0Q=0) with similar user features as those in the treatment (Q=1Q=1) that would produce higher propensity scores. In contrast, the Q=0Q=0 users have primarily U=1U=1 users with high propensity scores, leading to poor estimates in these strata. Experiment analysis often cannot rely on the assumption of faithful adoption of the treatment condition. Here, we’ve explored a case where many users assigned the treatment do not actually experience the treatment for a long time period after the beginning of the experiment. 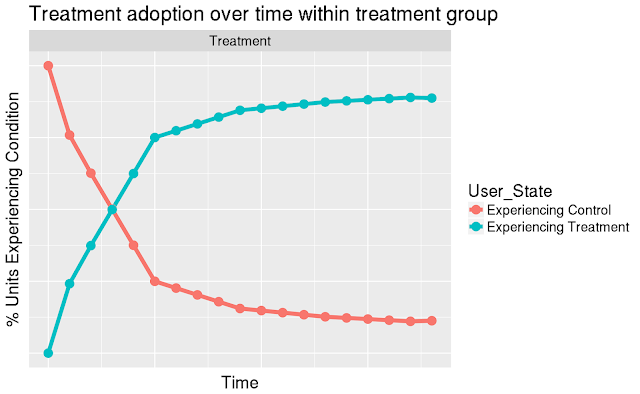 Moreover, waiting until a steady state of treatment adoption to draw inference is often impractical, so we have to make do with a biased early subset of users. As we’ve shown, adjustments are possible, but a litany of assumptions and concerns must be dealt with. Several complexities are left unaddressed here, such as effects that evolve over time or large volumes of users falling into ‘defier’ or ‘always-taker’ categories that require further refinements of approaches. Nonetheless, propensity based models often provide insightful refinements to the basic ITT or TOT approaches, and would form the basis for methods that would address these complexities. Have, Thomas R. Ten, et al. “Causal Models for Randomized Physician Encouragement Trials in Treating Primary Care Depression.” Journal of the American Statistical Association, vol. 99, no. 465, 2004, pp. 16–25. JSTOR, JSTOR, www.jstor.org/stable/27590349.